PROVO — It's been said that everything is bigger in Texas. 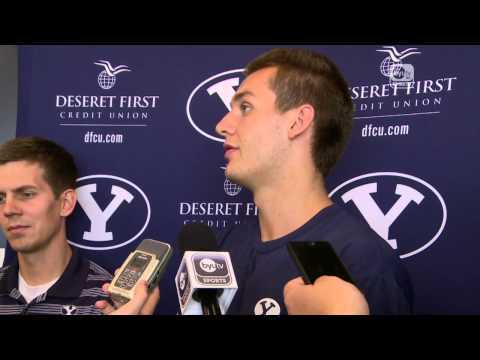 From Kyle Collinsworth's perspective, that phrase may as well belong to Russia. That's where the BYU basketball player has been for the last two years, serving in the LDS Church's largest mission (by geographical area), Russia Vladivostok. So naturally he's given himself the nickname "Big Russia." Big Russia, er, Collinsworth, said one of the most important things he learned while on a mission was being mentally tough. After running his first mile in training since coming back to Utah in May, he said he was physically done after one lap. However, he was mentally strong enough to push on and finish in around the six-minute mark. His body looks bigger than it was when he played as a 6-foot-6 freshman guard who averaged 5.8 points, 5.1 rebounds and 2.1 assists per game during the 2010-11 season, which ended in an overtime loss to Florida in the Sweet 16. At 215 pounds, he weighs just five pounds more than he was listed then, but now his more mature frame can put on muscle more easily. "I’ve being doing a lot of different things," he said of his training. "A lot of swimming, I go to yoga two to three times a week. (I'm) trying to get my body right and flexible again." It may take awhile for Collinsworth to return to form, especially since he didn't play a minute of basketball while on his mission. In fact, he didn't even touch a basketball in Russia. "They do (have hoops) there, but I don’t think playing basketball five to 10 times is going to make a difference," he said. "I was there to be a missionary, and that's what I did." He did receive some bad news while he was gone, learning that his brother Chris, who played three injury-plagued seasons with BYU, ended his basketball career after undergoing micro-fracture surgery on his ankle last September. "Obviously, it was pretty hard for me," Collinsworth said. "He always said the round ball goes flat for everybody, it’s just a matter of when. He’s got his head on straight, and he’s going to be great in whatever he does. He’s very positive, he’s taught me to be positive all the time." He's also taught Collinsworth to take it slow after returning from a mission. And that's been Collinsworth's mantra since he started workouts in June. "I’ve made a lot of progress," he said. "I’m really surprised by my progress so far, and the key is no setbacks — I’ve got to listen to my body. The hardest part of the whole deal is patience. "Sometimes I think I’m ready to play a game right now, but I’m not." Luckily, he has an example of how to come back strong from a mission. Tyler Haws, who like Collinsworth was a Deseret News Mr. Basketball in high school, saw significant playing time as a freshman before leaving on a two-year mission. Haws averaged 21.7 points a game last season — 10 points better than he did in the 2009-10 season. "Tyler has taught me patience," Collinsworth said. "There's no rush. There's plenty of time." Time is something the former Provo High star is using well. Here's a typical day for Collinsworth: 1. About 30 minutes of individual time with coaches; 2. From 60 to 90 minutes with his shooting coach, Paul Peterson; 3. Weightlifting and conditioning; 4. Pickup ball with his BYU teammates. That time playing pickup is especially important. His teammates are almost entirely new to Collinsworth, who is the only player left from the Cougars' 2011 NCAA Tournament Sweet 16 run. He says he likes what he sees. "Our team is really athletic," he said. "I'd even go out and say I think this is the most athletic team BYU has ever had. Our guard line is really deep. Eric Mika, I've never seen a big guy like that who could jump like he can." Collinsworth's versatility earned him 27 starts as a freshman, and he sees that same attribute helping him with this team. Mostly, he wants the ball in his hands, but he knows how to share. In a pickup session on Monday, he and fellow guard Matt Carlino traded off bringing the ball up and won four straight games. Despite playing in a different conference and with different teammates, all these pickup games and hours of training will hopefully lead to something he remembers well — winning games against the top teams and going deep into the NCAA tournament. "The last game I won was against Gonzaga, so the one thing I want to do is get a win against Gonzaga," Collinsworth said of the Bulldogs, who BYU defeated in the second round of the 2011 NCAA Tournament but has gone 1-4 against them since. "It’s been awhile for us."